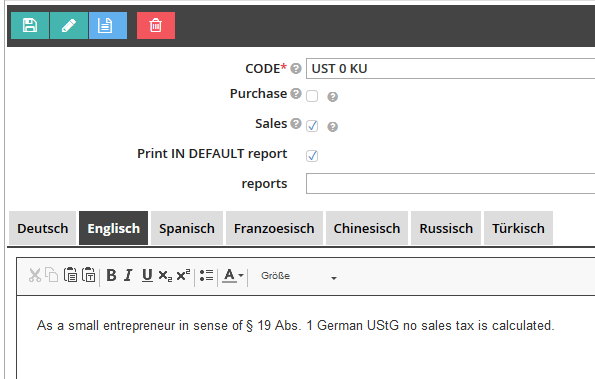 In reybex, you can display sales VAT information on your invoices and receipts. You can also store these notes in different languages. reybex automatically prints this information on the invoice depending on the VAT Key and selected language. Open the transaction Check Tables [BAS01] (Prüftabellen) > Tab: Basis > Text modules. Click on New (green plus button) and create a new text module. Enter a code (you will need this to find the text module later in the overview of VAT Keys). Determine where the text should appear (check the box) and set the text in the desired languages in the text field. You now assign your text module to the VAT Key. Open the transaction Check Tables [BAS01] (Prüftabellen) > Tab: Base > VAT Key. Click on New (green plus button) and create a new VAT Key. Assign your text module to the VAT Key in the Name field.